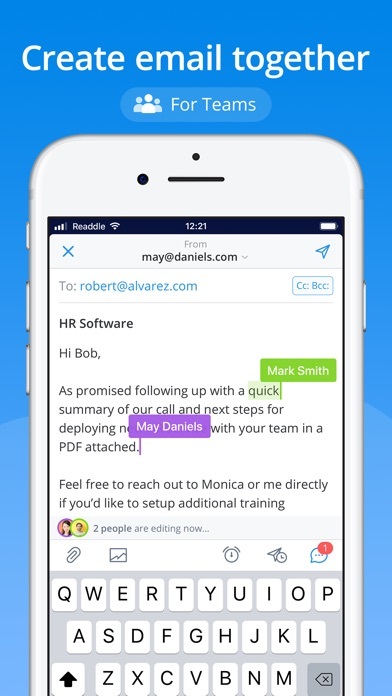 Spark - Email App by Readdle App Data & Review - Productivity - Apps Rankings! 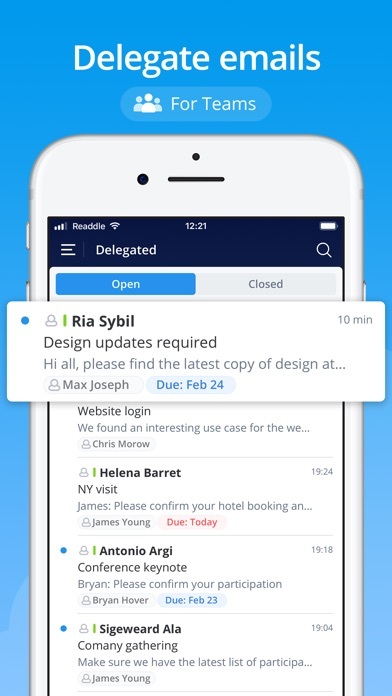 Spark - Email App by Readdl.. 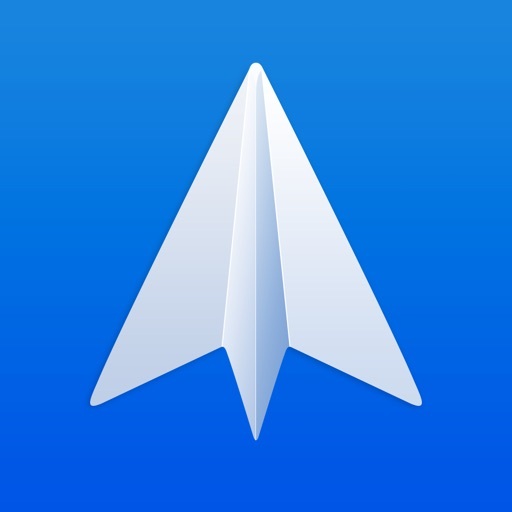 The applications Spark - Email App by Readdle was published in the category Productivity on 2015-05-29 and was developed by Readdle Inc.. The file size is 133.51 MB. The current version is 2.3.2 and works well on 11.0 and high ios versions. Thank you to all who reached out at [email protected] and helped us track down the bug; without you, this fix would not have been possible. Do you like Spark - Email App by Readdle applications? Please share! The application make me do my searches easy including using the filters to see the most interest, yes.., but when participating on live auction everything happens to fast on the last seconds that the process just make me be disorient and also something goes wrong with the time that I was out for near 5 minutes. The watch list is good, but not manage it. Removing items that are group by any of the tags suggested just make the watching list to return to the original stage reloading, what’s probably necessary, but uncomfortable. Finally, what makes me feel real bad of its is the reloading when you return back to it after changing for another iPhone apps or from lock screen. It just reload on its default home screen, which may be correct, but I lost what was looking before. Yes return to watched items may resolve the problem, but always. I am sorry, to put all of this here, it should goes to customer support or another place, but not sure where. Don’t get me wrong, I use it a lot. I love the “feature set” the app purports to have except the fact that Outlook and Mail.app are pulling up a particular message right now and Spark consistently cant retrieve messages (current one included)- as a professional this makes a difference when deciding on an email app. Additionally badges are delayed being updated and messages consistently get stuck in the outbox. The support is terrible too. I’ve tweeted to them about this issue many times and no acknowledgement or support. I am loving the template feature of this app. I wish there was a way to categorize or order the templates so I didn’t have to scroll through all of them. The template feature is by far the best I have used in an email app. I love this app! The smart sorting feature works very well and the whole interface looks clean and neat. Another thing I like is the integrated calendar since most times the events I make are from emails anyways. There’s just a couple things I wish this app did better: 1.) Make the integrated calendar better. Maybe even make a separate page for it like they do with Outlook and different views besides the week view. 2.) Create widgets for calendar events and email. Change these things and I’ll make my review 5 stars! I was wary before trying spark. After just a few hours it is now my new email app. I use several different gmail accounts for work, my personal email and other email clients. After gmails latest “update” which was an ugly facelift that slowed everything down I was becoming beyond frustrated. Thank you spark for streamlining my day. Ya obvious a lot of thought and care went into this app. Used to use mailbox, til that shut down. This picked up the ball where they dropped it and Spark just blew it out of the water. 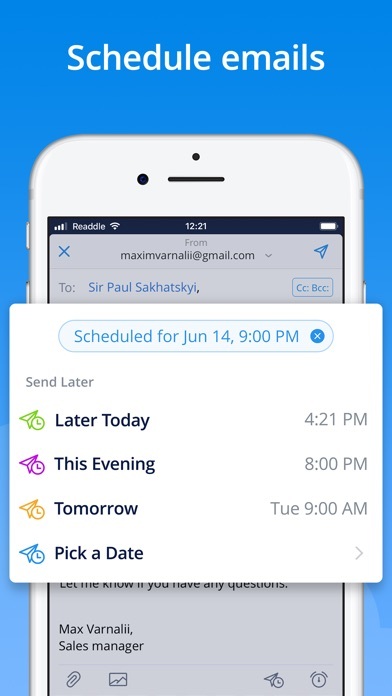 It helped organize 8000 emails in about an hour and now I never miss an important email throughout my day-to-day. The watch app is a great bonus. 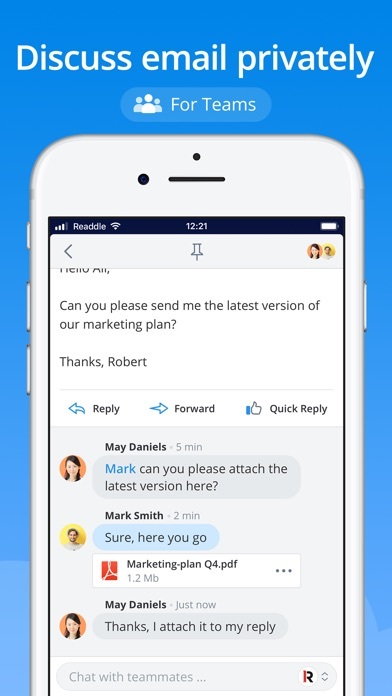 You can actually read your whole email and not some 3 line preview like many other apps. Calendar function needs work but solely as an email service, there is nothing better. EDIT: currently looking for new options. This used to be the best. But time after time I get a notification of an new email, tap on it and the app freezes. A new email comes in, I click on the attachment, and it freezes again. I’ve deleted and reinstalled. But this app isn’t what it used to be. It’s constantly making me force close it and reopen for it to work. I can’t spend this much time trying to open an email - not good. Captcha system login for lost passwords doesn’t work for yahoo. This app is not useful if I can’t login. Is this app a beta?? It doesn’t work well going from mobile, to iPad, to computer. There always seems to be issues. Every time my iPad updates it has to be set up again. It’s annoying to do that every time. I also receive a lot of spam and can’t figure how to stop it. Docking one star purely for the spam handling. Cannot property identify spam at all and regularly classes legitimate emails as spam. Otherwise it is perfect! Best email app I have ever used, I love it to bits. I got more emails from the app developers advertising features than actual emails. Lasted two days before I deleted it. I spent months worrying about the demise on Inbox. Now I wish Inbox had been withdrawn earlier. 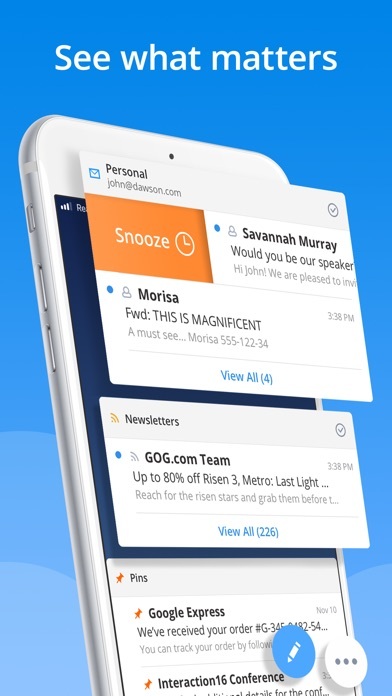 This is a stunning App better than Inbox and way, way better than Inbox’s impoverished sibling Gmail that Google promoted as Inbox was withdrawn. Love this app! I had 6000 emails and got to Inbox ZERO in no time. I’d love an improvement to recategorise (ie newsletter/personal etc) emails easier than having to tap into details. The desktop interface is easier for this than the app. Otherwise, this is amazing. There used to be another option for displaying widget. Kinda disappointed that you removed it in the latest update. And the bug is: sometimes, email can't be opened by tapping notification. Great email client but useless for personal use as doesn’t appear to work with external calendars (not even Readdle’s own calender 5 product). I’ll now have to try and revert to mail. After being a die-hard gmail app devotee, have made a complete switch. 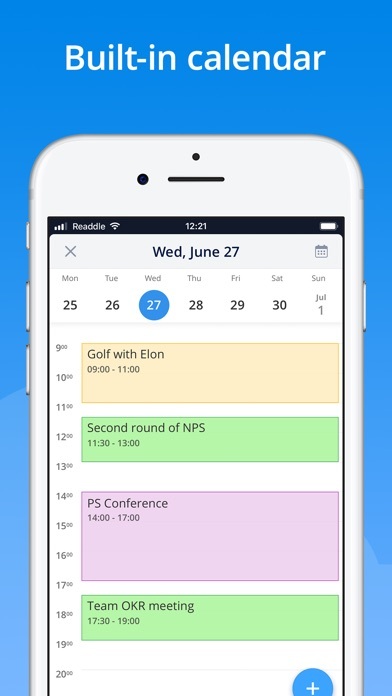 The app is simpler and prettier, and more integrated with calendar than gmail. I just need a few things fixed and I’ll be a total convert: - reminders don’t sync - email accounts should be a collapsible list instead of always visible - need an option to select/tick multiple emails - option to have multiple selected emails stay selected after being marked read/unread rather than having to reselect for deleting And last but not least, dear God it is slow. So.damn.slow. About 25% of the time my mail will not load, just spins... unfortunately it’s usually when I need it the most! also, sometimes doesn’t send when I think it does. But outside of that, fairly satisfied. Set up with Gmail account. Wrote short email to one person. Hit “Send”. Received notification email not sent. Spark is still open. Go to outbox yup it’s stuck there. Hit “send” get “ message sent” Nope. Still in outbox. And getting better. My ONLY request is the ability to temporarily snooze/disable whole accounts. It would be great to easily turn of my work account during the weekends to not temp myself to engage and then flip it back on when I’m ready. Keep up the great work! 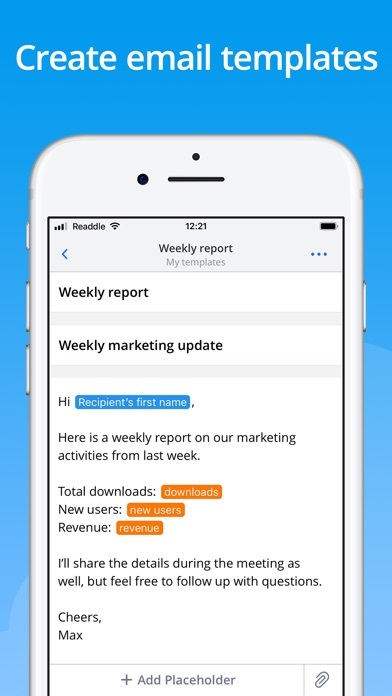 Readdle has not incorporated iOS Dynamic Text functionality into Spark, so users are stuck with the default (small) font size in the app menus and message viewer. I wish I could increase the display font size, but more than that, I wish Spark took advantage of native iOS features for accessibility. This is a bit issue and I don't think it deserves the Apple awards it has received on this principle alone. Grateful that they finally added swipe to access folders but now a lot of emails are not formatting properly. WOW still another update and still no swiping to access folders. 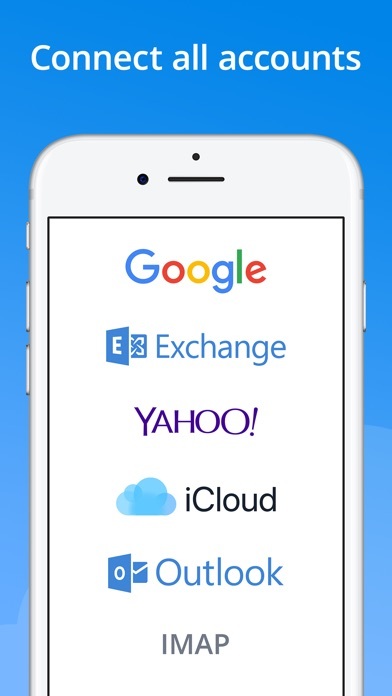 Can’t be that hard to implement considering every email app on the planet has it. Well except this one I'm done with this app. Update after update and still no swipe to access folders. Absolute joke. 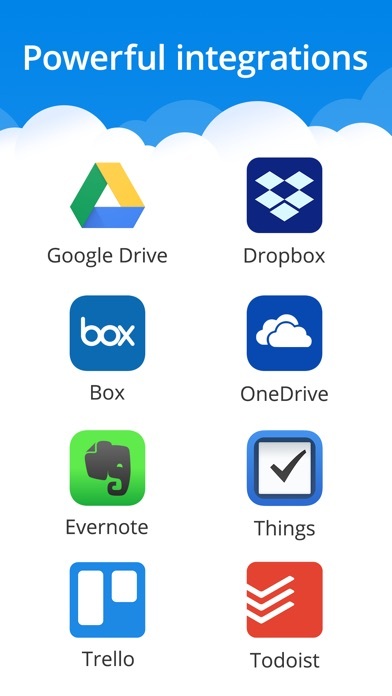 Hire some competent devs THEY KEEP ADDING FEATURES EXCEPT SWIPE TO ACCESS FOLDERS. A FEATURE EVERY OTHER STUPID EMAIL APP HAS. Update after update and still no swipe to access folders. A basic feature every email app has and it continually gets ignored. They screw up the app twice in a week, over 3 weeks later still no fix. Wish I could give it zero stars Gave this app another try and it's painfully slow loading emails. Sometimes it just spins for like 30 seconds. Update: push notifications are not working properly. Opened up my email at 11pm last night and 2 emails popped up from the 9:00 hour. This is a problem and I ultimately decided to delete this app. Every email app allows you to swipe right on the screen to access your folders, except this one. I hate having to click on the upper left corner of the screen to get to the folders. 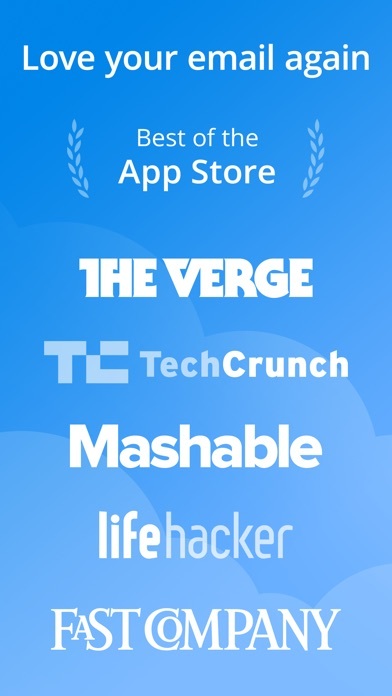 the app it’s pretty good in helping you with subscriptions since they all go newsletter and you easily delete them. Wish it could also help you unsubscribe from them as well as separate them from purchase, bills and other like edison email. As for decluttering I believe is the best. First, the fact that Spark can be on my phone, iPad and laptop is fantastic. One app that links between all my needs. Secondly, the program is great and keeps getting better. 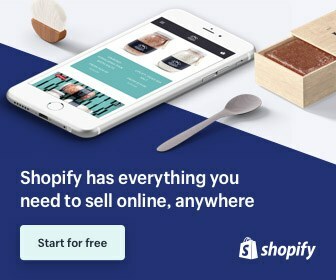 It has integrated so many things that are necessary for everyday use such as spam filters, templates, smart inbox for multiple accounts, color coding accounts for fast mail source identification and so much more. Pretty solid app but missing a few key things: 1.) In my O365 account when I get a meeting invite there is no option to Accept / Decline / Tentative to “Send a Reponse Now” or “Do Not Send a Response” when choosing an option. Would be nice to know if what I’m doing is being sent back or not to the person who sent the invite. 2.) It also appeared that when I accepted a meeting it actually did not disappear from my Outlook app’s inbox 3.) Allow color categorization of calendars. Let us choose what color we want showing in the calendar for our events.